One-sentence knee-jerk re-visitation reaction on this album: I wondered why I had forgotten about this album until I listened all the way through again and was reminded. The pros: As has come to be expected of Dirty Projectors, the vocal harmonizing is impressive and at times, borderline awe-inspiring. There's no question that their crazy vocal bit requires both talent and skill. 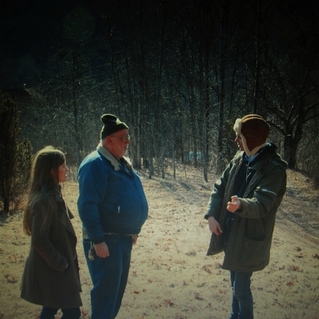 This makes Dirty Projectors one of the few bands in the current generation of Brooklyn indie muck with a truly signature sound. The cons: The instrumentation. As in, what the hell happened to the instrumentation? The non-vocal elements here seem included less as a vehicle (which wouldn't be all bad) and more as an "excuse" for the high-level vocal harmonics. The instrumental elements presented are sloppy--but not in the endearing/offering an artistic contrast sort of way. The instrumental work is lazy, cynical, and seems inserted for about 85% of the album only because Dirty Projectors feel like they aren't allowed to just make the acapella/hand clap album they've got such a hard-on to make and get away with it. There's nothing wrong with sloppy and abstract instrumentation done for effect. But there IS something wrong with sloppy and abstract instrumentation that is both painfully uninteresting and which detracts from an already obtuse and average collection of lyrics. Random note about the drumming: A 1980's Casio could easily replace nearly all the percussive, ahem, "rhythm" that sadly is coming from (I think) a real live human (think how much money DP could save on salary and health benefits by cutting the "drummer" out). Final verdict: The vocal harmonizing was top notch on their previous album, Bitte Orca, too, but the primary difference is that the non-vocal elements, i.e. the drums, the guitars, the synths sounded like some thought and effort had been put into them. In short, the songs were much more interesting than most of what's found here. The technical ability of the vocal work here has a chance of sucking you in, but Swing Lo Magellan is a lot like a beautiful modern work of architecture that you marvel at from far way, only to go inside and see that it's got a basic lobby and a Starbucks and a bunch of cynical hipster irony masquerading as relevant art. And I say this as someone who enjoyed their last album quite a bit. When evaluating almost anything in life, one of the fundamental questions you ask yourself is "Why should I care?". But while there are a few decent moments here, overall I'm not given enough reason to care--sadly because whether fair or not, Dirty Projectors--outside of the vocal work here--don't even sound like they care all that much. Highlight Tracks: "Offspring Are Blank", "About to Die", "Unto Caesar"
Low-light Tracks: "Just From Chevron", "Maybe That Was It", "See What She Seeing"